St. Martin's Griffin, 9780312316129, 288pp. Not only is it the world's largest and most watched sporting event, but also the most fearsome physical challenge ever conceived by man, demanding every last ounce of will and strength, every last drop of blood, sweat, and tears. If ever there was an athletic exploit specifically not for the faint of heart and feeble of limb, this is it. So you might ask, what is Tim Moore doing cycling it? An extremely good question. Ignoring the pleading dictates of reason and common sense, Moore determined to tackle the Tour de France, all 2,256 miles of it, in the weeks before the professionals entered the stage. This decision was one he would regret for nearly its entire length. But readers--those who now know Moore's name deserves to be mentioned in the same breath as Bill Bryson and Calvin Trillin--will feel otherwise. They are in for a side-splitting treat. 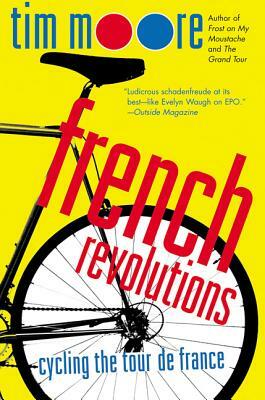 French Revolutions gives us a hilariously unforgettable account of Moore's attempt to conquer the Tour de France. "Conquer" may not be quite the right word. He cheats when he can, pops the occasional hayfever pill for an ephedrine rush (a fine old Tour tradition), sips cheap wine from his water bottle, and occasionally weeps on the phone to his wife. But along the way he gives readers an account of the race's colorful history and greatest heroes: Eddy Merckx, Greg Lemond, Lance Armstrong, and even Firmin Lambot, aka the "Lucky Belgian," who won the race at the age of 36. Fans of the Tour de France will learn why the yellow jersey is yellow, and how cyclists learned to save precious seconds (a race that lasts for three weeks is all about split seconds) by relieving themselves en route. And if that isn't enough, his account of a rural France tarting itself up for its moment in the spotlight leaves popular quaint descriptions of small towns in Provence in the proverbial dust. If you either love or hate the French, or both, you'll want to travel along with Time Moore. French Revolutions is Tim Moore's funniest book to date. It is also one of the funniest sports books ever written. Tim Moore is the author of French Revolutions, The Grand Tour, and Frost on My Moustache. His writing has appeared in the The Sunday Times, The Independent, The Observer, and The Evening Standard. He lives in London.